Join us for KIPCOR’s new Continuing education Series for Everyone! You will engage with local and regional experts each month to gain the everyday skills you need to lead and thrive in a diverse, changing, and polarized world. Take home skills for use in your families, workplaces, and communities. 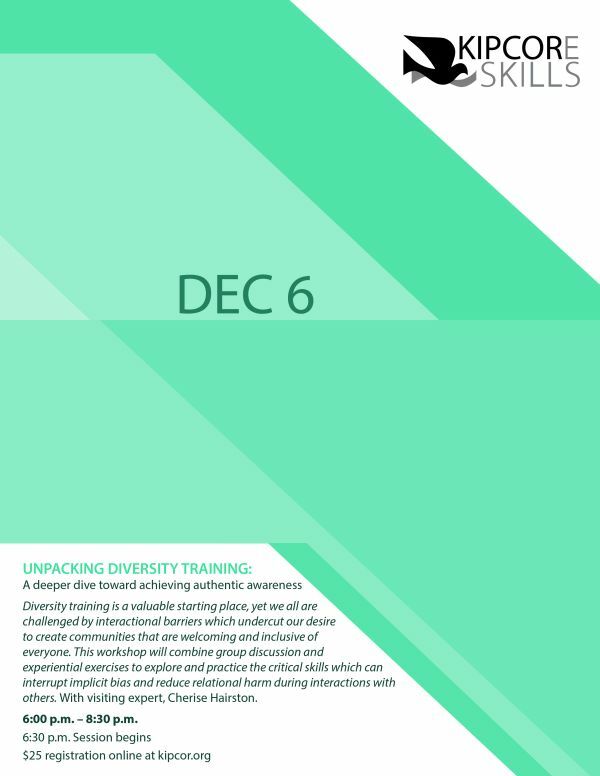 This month’s session, on December 6, features national expert Cherise Hairston presenting Unpacking Diversity Training: A deeper dive toward achieving authentic awareness. Diversity training is a valuable starting place, yet we all are challenged by interactional barriers which undercut our desire to create communities that are welcoming and inclusive of everyone. This workshop will combine group discussion and experiential exercises to explore and practice the critical skills which can interrupt implicit bias and reduce relational harm during interactions with others. Join us at 6:00 PM for networking and a light snack. The session begins promptly at 6:30 PM and concludes at 8:30 PM.